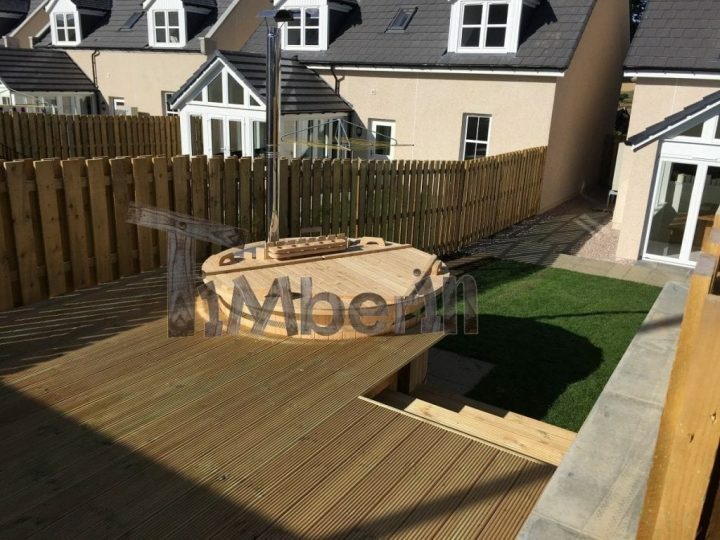 I’ve attached some photographs showing the hot tub in its final place. As you’ll see I’ve yet to fully finish the decking but it’s pretty much there. The hot tub is exactly what we were looking for and the build quality is fantastic. As per previous feedback on your website, the whole service from order to delivery was brilliant. Everyone at TimberIn was very helpful and professional. The hot tub eventually reached the end of it’s journey (Kaunas to Insch, NE Scotland) late on a Thursday night. However the delivery drivers could not have been more helpful in ensuring the tub was properly installed before they left. We lit the hot tub that weekend during a family barbecue. Everyone was very impressed and couldn’t wait to try it out – adults and kids all had a great time. It keeps it’s temperature very well which is aided by the lid supplied. It’s a great addition to our new home and we’re very happy with it.